On January 26, the Carrboro wrestling team hosted the 2019 2A MidState Conference tournament. The CHS team wrestled at home against Bartlett Yancey, Reidsville, Cummings and North Carolina School of Science and Math (NCSSM). Carrboro placed second overall with 111 points out of the five teams. They also finished with three runner ups and three Conference champions out of nine wrestlers competing. Brian Buck, Alex Malagon and Israel Medrano were the runner ups for CHS. Aidan Thorne and Matteo Fulghieri and Hank Hultman were crowned conference champions. Reidsville finished first with 137 points and five conference champions, Cummings finished third with 104 points and three conference champions, Bartlett Yancey finished forth with 85 points and two conference champions and NCSSM finished fifth with 68 points and one conference champion. Hultman and Fulghieri claimed their second conference titles of their careers. 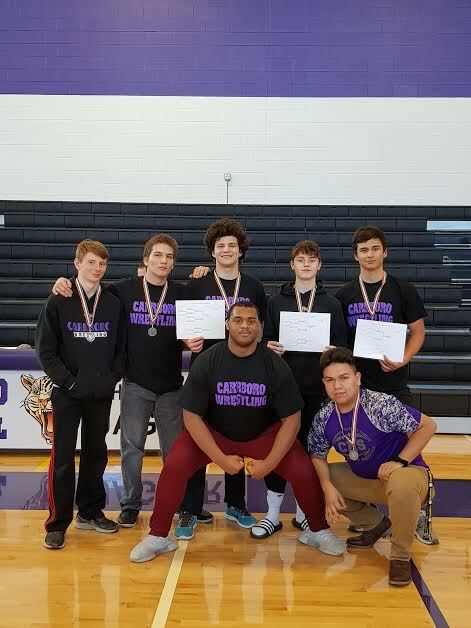 Carrboro wrestlers Buck, Malagon, Medrano, Thorne, Hultman and Fulghieri were named All-Conference, finishing top two in their weight class. Additionally, Jacobie Lewis was named All-Conference under an at large bid, voted by the coaches. As a final victory of the day, Matteo Fulghieri was voted the MidState Conference Wrestler of the year. This marks the fourth consecutive year a CHS wrestler has claimed this title.